In support of the Student Athlete documentary from HBO, SpringHill Entertainment, and UnitedMasters, Scholly is establishing a scholarship to help one lucky student athlete win $10,000 to pay for college. Scholly is proud to announce the creation of a scholarship specifically for rising and current college student-athletes, to celebrate the release of HBO, SpringHill Entertainment, and UnitedMasters’ upcoming documentary: Student Athlete. If you are a student athlete yourself, please complete the application below to have a chance to win $10,000 to pay for college! Also, check out the documentary Student Athlete now on HBO, revealing the hardships endured by unpaid NCAA athletes! Applicants must be at least 18 years of age or of the age of majority in their state of residence to apply. Complete our Student Athlete Scholarship Application now for a chance to win $10,000! What sport (primary) do you play? * What sport (secondary) do you play? Share the Scholly Student Athlete Scholarship on Facebook or Twitter using the buttons below and tag @MyScholly to complete your application! Thank you for submitting your Scholly Student Athlete Scholarship Application! Should you be selected to receive the scholarship, we will follow-up with details to begin the process of verifying your personal information and enrollment status. Should you have any issues submitting your application, contact us here. 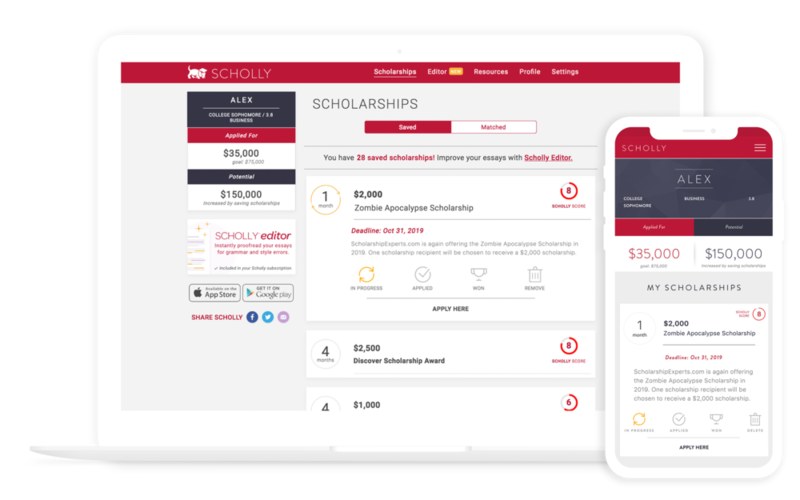 Should you be selected to receive Scholly’s Student Athlete Scholarship, we will follow-up with details to begin the process of verifying your personal information and enrollment status. Scholarships are looking for you and they're waiting for you on Scholly. save you thousands on your education. Student Athlete photos and other program assets courtesy of HBO. All rights reserved. HBO® and related channels and service marks are the property of Home Box Office, Inc.